Two more visual novels en route to the Sony handheld. 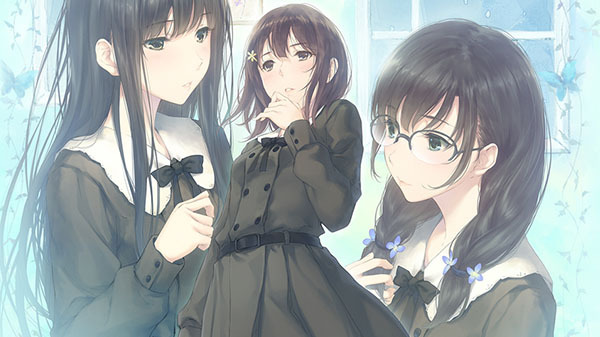 Prototype is bringing Flowers -Le Volume sur Hiver- to PS Vita on March 16, 2018 in Japan for 4,800 yen, the latest issue of Weekly Famitsu reveals. The magazine also reveals that the PS Vita version of Kanojo Step, which is published by GN Software, will launch on March 21, 2018 for 6,800 yen. The magazine does not mention any additional elements for either title, which are both already available for PC. challenged Suou after becoming the president of Council of Nicaea and overcoming the trials from Yatsushiro Yuzuriha. As promised, the name given was “The Seven Wonders of the Beginning of the End,” directly linking Kousaka Mayuri, her amity who disappeared in Spring. A number of even more bizarre events arise in Saint Angraecum Academy during the season of Winter. With the help of her friends, Shirahane Suou will stand up against many obstacles, but… the words she prayed to God, “Please forget about me,” still overwhelms her. The reemergence of her step-mom’s shadow, passing thoughts, unexpected continuations… Just what will it all bring about to Suou? The protagonist has moved too many counts to count and this time, he has ended up in his grandmother’s minshuku located in Shirasagi, a rural town situated near the mountains. His sister told him that this was their last move, and after he graduates from school, he will be free to do as he wishes. After suppressing his feelings of love until now, he sets out to pursue his first love.